FSGV is navigating another transition, and we will emerge from it in a better space from which to serve our local community. The building that houses our office space is being demolished, and so we are faced with an unexpected move. Click here to read about the development that will be built on our current location. Although we are disappointed by the need to move due to property re-development (the second time in six years), we are very excited by the prospect that this is last time we will be forced to do so. This August, we are moving into the former Multiple Sclerosis Society building at 1004 North Park Street. This building will become a new centre for community service innovation, with space to be rented out to other non-profits - including the Victoria Immigrant and Refugee Centre Society. 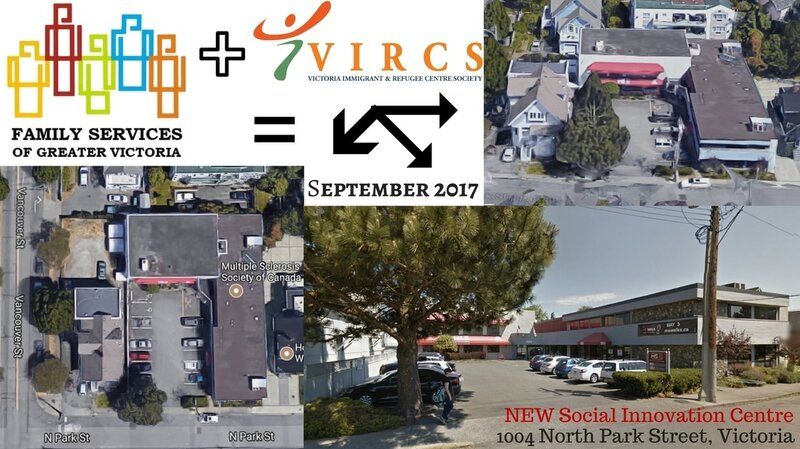 Community organizations working together under one roof - enjoying the benefits of setting down roots in a stable, co-owned location - will soon be reality in Greater Victoria. We are finally going to have the permanent home in our community that we have hoped for over the past 39 years. You can count on us to make this unexpected move count. We need your help, but you won’t have to lift boxes or carry furniture. FSGV is fundraising for our upcoming expenses associated with moving, and the necessary leasehold improvements required to renovate and furnish the older building. In order to modify the space for our specialized programs, we anticipate having to spend almost as much as we did on our current space five years ago: about $100,000. Most of the resources that we have put into customizing our 899 Fort Street location over the past five years cannot come with us. Our operating funding comes from donations, grants, and fees. We are working tirelessly to secure the necessary funding to make the move and keep the doors open. We are recognized as a fiscally-responsible charity, and we guarantee that all donations will be put toward this initiative. Copies of our Annual Reports are available here. Can you make a contribution to our relocation campaign? We have set up a crowdfunding website to accept donations. This makes donating online easy and secure. Please go to www.youcaring.com/FSGV to make a contribution today! ​As always, you can donate in person at our office by cheque, cash, or card; over the telephone by credit card; and at our usual online donation server. Please specify that you would like your donation to be put toward our relocation campaign. Family Services of Greater Victoria thanks you for your support. Thank you Odd Fellows Victoria Lodge #1! ​In the spirit of "friendship, love, and truth", this group of Odd Fellows has donated $10,000 to this campaign. We are so grateful for this substantial contribution! ​Read about their generosity in our news release here.